Like traders trying to make sense of the stock market’s daily random walk, the reasons cited for Supercell’s supposed “first ever” decline in annual sales and profits were a confusion of facts, misunderstandings and sheer nonsense. “Ageing portfolio”, “cooling sales”, “seeking a new hit”, “without a new game”, and “despite mobile gaming market growth” went some of the attempts. The latter was the most egregious: conflating the recent success of billion dollar games such as Arena of Valor, Lineages 2 and Lineage M in Southeast Asia with the addressable market for original and Western-developed IP. But perhaps the likes of App Annie and Superdata should take their share of blame for their constant cheerleading of the mobile games market as some sort of perpetual growth machine. More insidious, however, is the assumption that to increase sales developers need to be releasing more games. Granted Supercell is an outlier in terms of only having four live titles, but if 2017 taught us anything, it was the doubling down on live operations, not risky game launches, that is the most effective way to increase sales and especially boost profitability. Supercell’s situation in 2017 is predominantly a question of its scale. Examples include Zynga’s work with CSR Racing 2 and Zynga Poker, as well as King’s reinvigoration of Candy Crush Saga, another billion dollar game and one not much older than Supercell’s first releases. Yet, even CEO Ilkka Paananen cited Hay Day and Clash of Clans being five years old and that Supercell didn’t globally release a new game in 2017 as reasons for its ‘headline numbers not being as high as last year’. It’s very hard to keep a $2 billion-a-year company growing even in a $45 billion-a-year market, especially when the maturing of the non-Asian mobile games market means Supercell's backyard is becoming a zero sum play. Brutally put, not even the world’s best mobile games developer is now guaranteed to release another game that generates a billion dollars of revenue as Clash of Clans and Clash Royale have done. An alternative view on the same situation is provided by what happened at MZ. The only other Western developer to release two billion dollar mobile games (Game of War and Mobile Strike), in mid-2017 it pulled all its marketing from those games to focus on new release Final Fantasy XV: A New Empire. Supercell generated around $9 million per employee. MZ is a privately-held US company so doesn’t release its financial figures, but no doubt this move resulted in a heavy hit on sales, most likely also boosting its profits. And, less radically implemented, this is a trend we’d expect to see in a maturing market. Growth becomes harder to find, but operational improvements and cost cutting enables profits to grow. 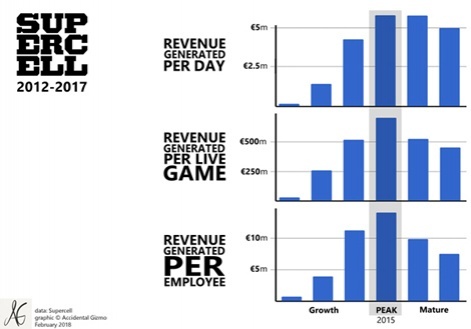 In that context, it’s interesting to look at Supercell’s profit margin. This peaked at over 45 per cent in 2013 when Clash of Clans took off and the company only had 132 staff. 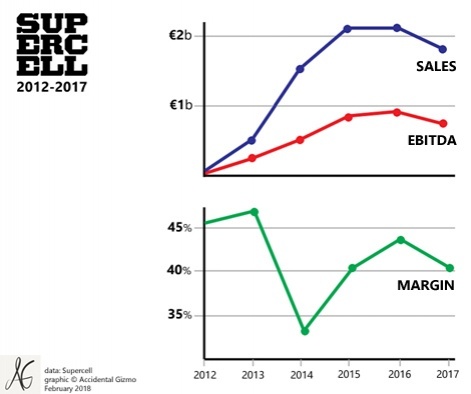 It ‘crashed’ to 33 per cent in 2014 as Supercell started to rollout the heavy-duty marketing required to make the game a global hit, but since 2015 it’s been a steady 40 to 44 per cent, which remains an insanely high level of profitability. Even now, Supercell ended 2017 with just 241 staff compared to around 900 for MZ and 5,700 for mobile gaming’s most populous outfit Gameloft. This means Supercell generated around $9 million per employee. The comparative figure for Apple - not an apples to apples comparison, granted - is less than $2 million. As for the future, for those who care about that sort of thing, Supercell’s sales trajectory for 2018 remains in the balance. As I’ve previously argued, Brawl Stars' prolonged period in soft launch doesn’t suggest Supercell is hugely confident about the game. Some industry insiders have remarked on what they label its underwhelming monetisation, with one going as far as to predict the game will be canned. Supercell has almost been anti-commercial in its attitude towards its incredible financial success. Certainly that would be a surprise - and personally a disappointment - but not unthinkable. One irony of the situation is Supercell has almost been anti-commercial (or at least a-commercial) in its attitude towards its incredible financial success. As much as it can be, it’s always been about the games, or ‘only releasing games that are the very best for our players’, as Paanenen puts in. Indeed, this was made clear to me a couple of years ago when I received a furious phone call from Paananen complaining I’d reworked the Supercell logo, replacing the ‘S’ with a dollar sign ($upercell) when reporting on earlier financial news. In that regard, having to publicly comment on its financials - good, bad or indifferent - is likely the most uncomfortable part of Paanenen’s low-key CEO role. That's why his reasoning was so unconvincing. Conversely, celebrating Brawl Stars' cancellation because it didn’t match up to Supercell’s expectations would likely be his least uncomfortable. And that’s why, no matter what happens to its numbers, Supercell remains the best - and the most valuable - mobile games company in the world.